But what’s the point of making that bet? We’ll find out shortly! Oh... that’s silly, it looks like my brain couldn’t decide between FL26 and TX21 so it just picked both! Oh well, better to get the typos out of the way early in the night. We should expect many more votes from Florida’s panhandle than those that are currently reporting (at present — basically none). But there are also millions of votes left in southern Palm Beach, Miaimi, and Broward counties. 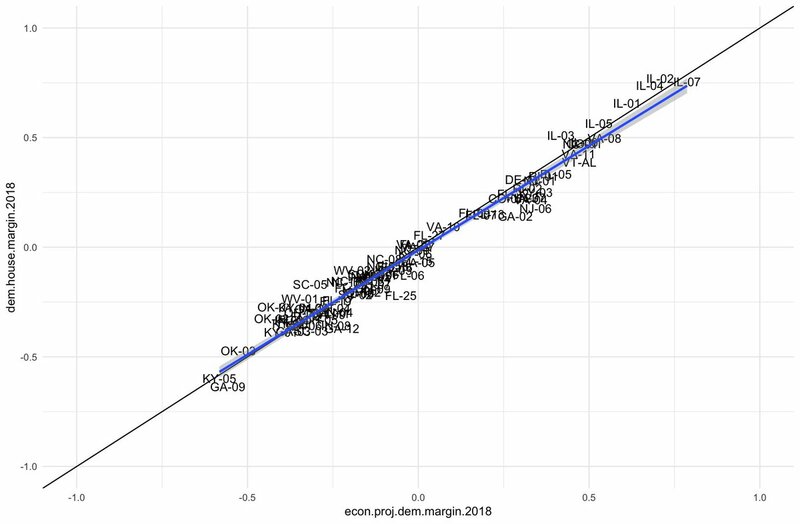 Gillum looks about as good as polls + EV said. 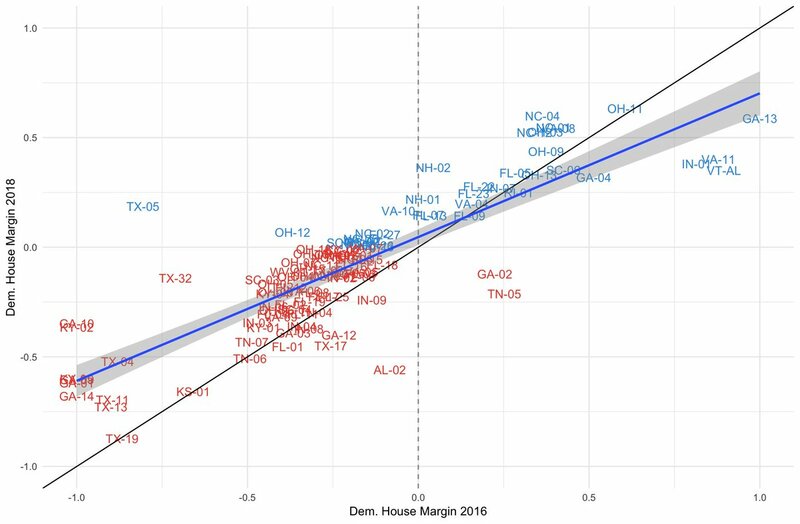 We don’t have many districts with which to forecast what current margins mean for predicted success, but if you forced me to run the model I have ready, it’d say that Dems are on track to win 220-30 seats — but with massive uncertainty still. It’s done. Jennifer Wexton (D) flips #VA10 from Republican to Democratic control, unseating Republican incumbent Barbara Comstock. This was rated as a safe Dem pickup, and has about a dozen Whole Foods. With 48% reporting in #VA07, Abigail Spanberger leads Dave Brat by nearly two points. 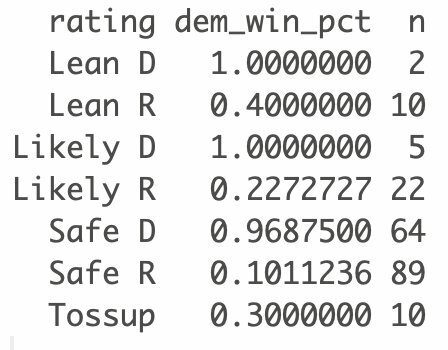 Like Wexton, she too is beating benchmarks, but unlike Wexton is not assured a victory. Just in: Democrats get their second flip of the night in #FL27, as Donna Shalala (D) will defeat Republican challenger Elvira Salazar. Currently, the seat is swinging 25 points from the margin it gave Clinton in 2016. In the counties that are actually reporting votes, Beto does not look like he’s hitting his benchmarks. But (and this is a HUGE but), there are no election day votes yet coming out of Dem strongholds in Houston and Austin. 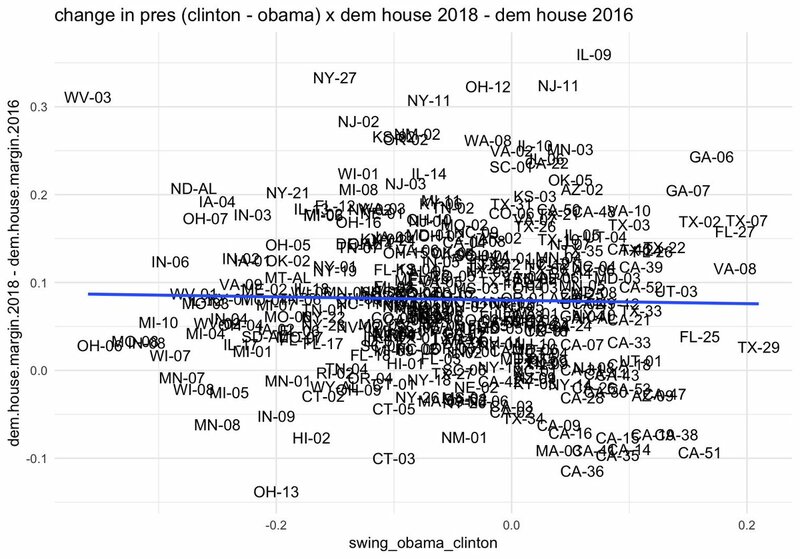 Sample size issue with some of this, but I think the House is bluer than some of y’all think. At least for now. Andy Barr (R) defeats Amy McGrath (D) in Tossup #KY06. Not one of those races that Democrats *needed* to win, but it could have helped them offset a surprise loss elsewhere in the country. Another Democratic pickup in #PA05 as Mary Gay Scanlon (D) defeats Pearl Kim (R) by double digits. Huge Clinton lead in 2016, was an expected outcome of PA redistricting. FOURTH Democratic pickup of the night comes in #CO06, where Crow (D) defeats Incumbent Rep. Mike Coffman (R). Crow looks headed for an 11 point victory. Clinton won by 7. I’m not one who likes to get egg on my face, but it sure looks like Democrats are going to win the House. In #PA17 Dems are going to get their fifth flip of the night (again, they need 23). Conor Lamb (D) defeats Keith Rothfus (R), as expected. Clinton got a hypothetical win here by 3 points in 2016. It’ll go to Lamb by 20. The SEVENTH Democratic pickup of the night will come in #FL26, where vulnerable Rep Carlos Curbelo (R) has been defeated by Debbie Mucarsel-Powell by 2 points. Clinton won by 16 points here in 2016, so not a huge surprise, but a much-needed Dem victory. EIGHTH Democratic Pickup as Mickie Sherrill wins by double digits in #NJ11. 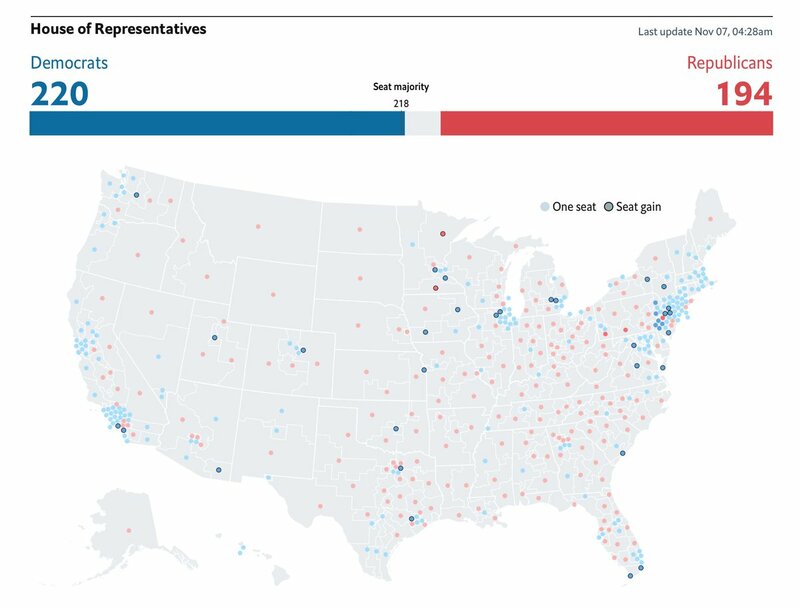 A Trump +1 district. BIG FLIP: Democrats will win in #KS03 where Sharice Davids (D) will win a slim victory over Kevin Yoder (R). This is the Democrats’ 9th flip of the night. Another big flip just in: Elaine Luria (D) defeats incumbent Scott Taylor (R) in #VA02 for Democrats’ TENTH flip of the evening. ELEVENTH flip for Democrats comes in #NY11 as Democrat Max Rose defeats incumbent Republican Dan Donovan. This is an R+10 seat and one of the more surprising Democratic wins of the night. On the way to a victory. Democrats FLIP #PA06 as Chrissy Houlahan (D) defeats Greg McCauley (R). The twelfth projected Democratic pickup of the night. PROJECTION: Democrat Susan Wild defeats Marty Nothstein (R) in #PA07, their THIRTEENTH pickup of the night. We’re into the teens now and getting flips all over the place. Democrat Colin Allred defeats 11-term incumbent Pete Sessions (R). The FOURTEENTH Democratic pickup of the night. Another flip: Haley Stevens (D) defeats Lena Epstein (R) in #MI11. This is the FIFTEENTH Democratic pickup tonight. Projecting that Dave Brat (R) will LOSE to Abigail Spanberger in #VA07. The SIXTEENTH Democratic pickup this evening. Democrats currently ahead in 11 of the 17 Obama-Trump districts that are reporting election results. They are also ahead in 7 of 8 Romney-Clinton districts. 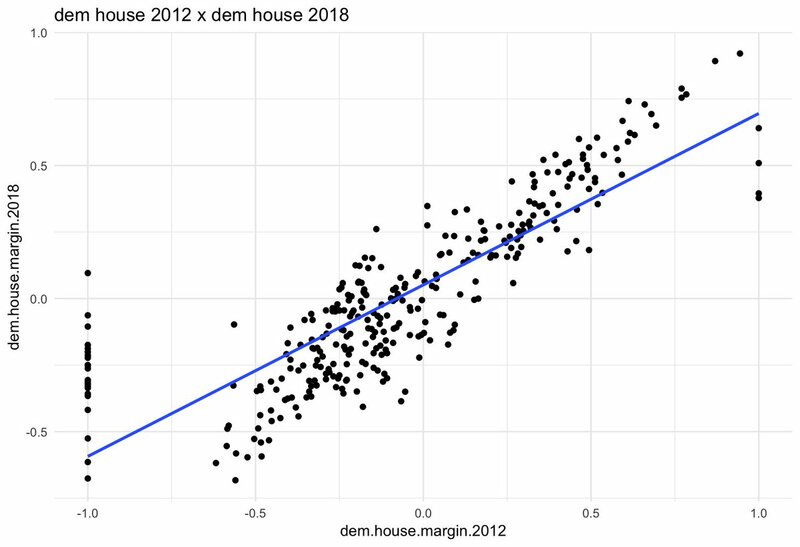 This election could be less of mean reversion and more of Democrats-turned-Trump voters “coming home” while the suburban women who shored up Clinton in close districts have become even more Democratic. Tonight is a victory for Democrats, sure but also for journalists who pre-wrote all their takes. As someone who contributed to forecasts that seem to be fairly accurate this year, you are welcome. D FLIP Sean Casten beats incumbent Peter Roskam in #IL06, a Clinton +6 district. TWENTY FIRST flip for Dems comes in #IA03 as Cindy Axne (D) topples David Young (R). Democrats get their TWENTY SECOND flip from #IA01 where Abby Finkenauer has defeated incumbent Rod Blum (R). Looks like a little more than half of voters’ ballots in the country have been counted now. 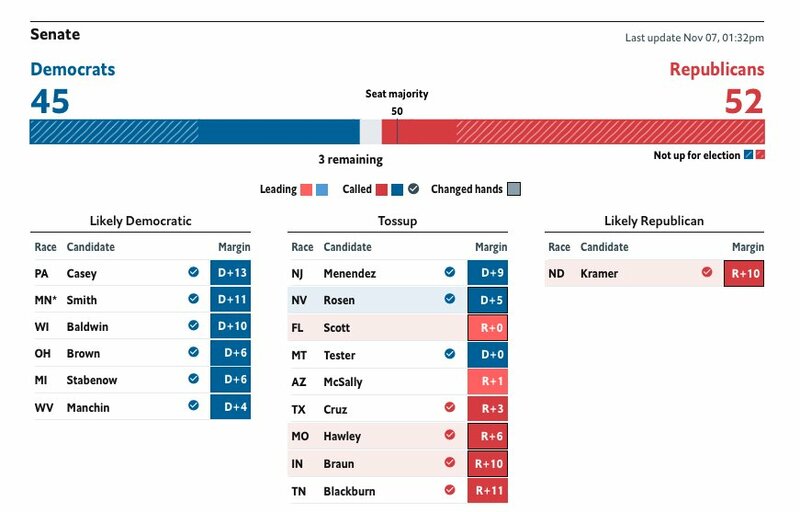 We’re at 138 D House seats to 149 R, but a forecast of 231 seats for Democrats after all is said and done. Democrats grab an upset victory in #GA07. They could still win in the sixth, but aren’t favored there. 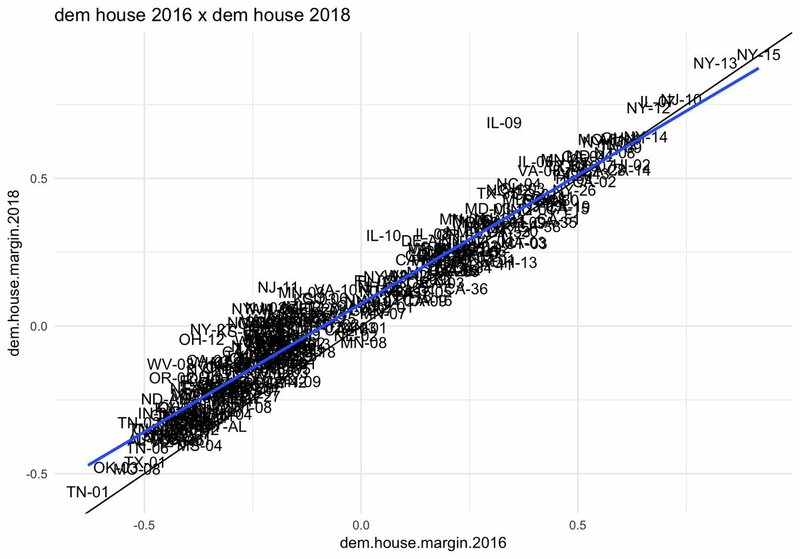 Theme of the night is Dems winning surprise upsets in Lean/Likely R seats, as we have been saying was likely to happen since, oh, I don’t know, March? Okay! That’s it for calls/results/picks from me! I’m moving into psephology mode. Here’s my leader: not a lot of mean reversion in the House today. Sure, the relationships are significant, but not powerful enough to drive the narrative. Democrats did well in the House. 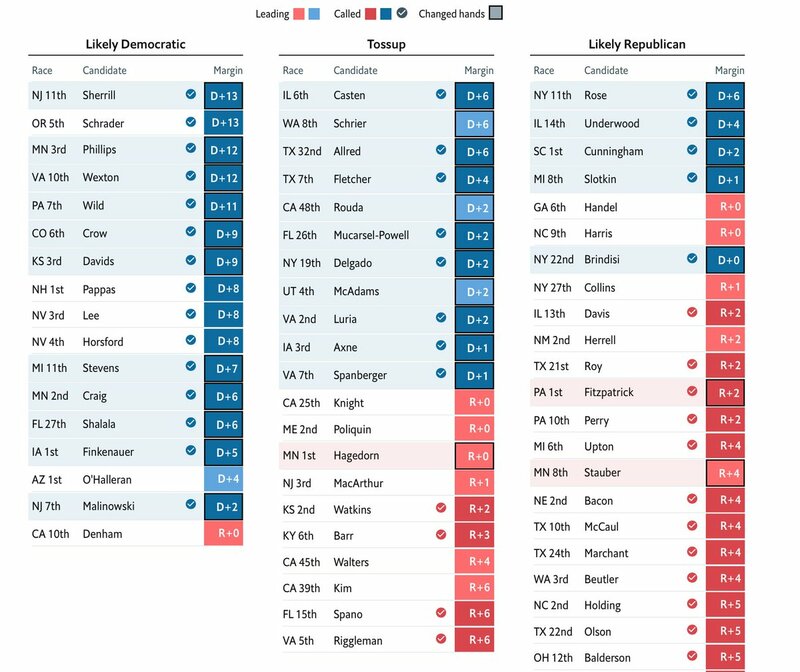 Republicans did well in the Senate. Pollsters and forecasters, though -- they did well everywhere. Cheers! - Walker (R) loses reelection in Wisconsin. - Rosen (D) defeats Heller (R) in Nevada's Senate race, the first Dem pickup of the night in the upper chamber. 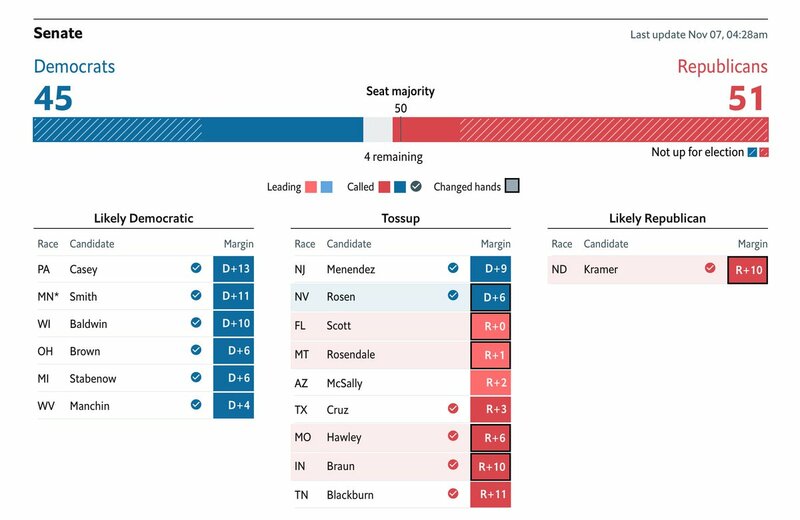 The 2018 mid-term elections results: The Democrats win back the House of Representatives but the Republicans expand their Senate majority. At just the House level, you can make a case to me that demographics played an independently polarizing role, too. 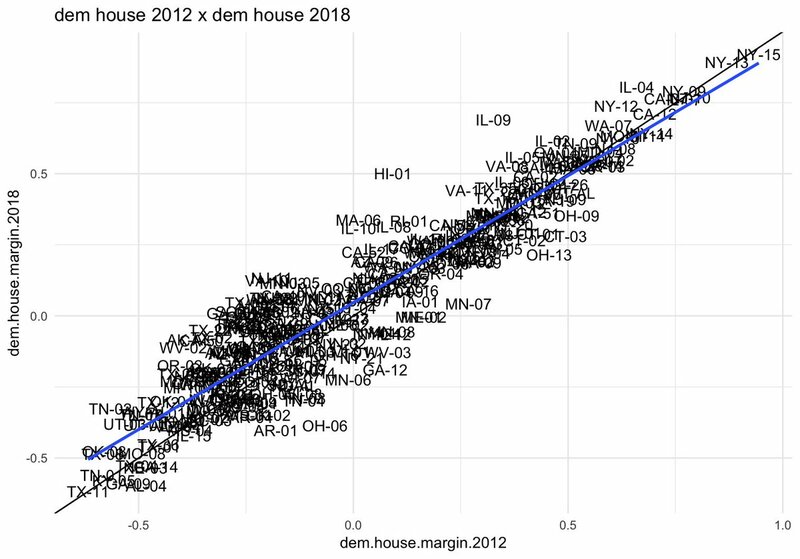 … (D) Raw votes increased most for Democrats in places I’ve just described, but so did raw Rep votes. 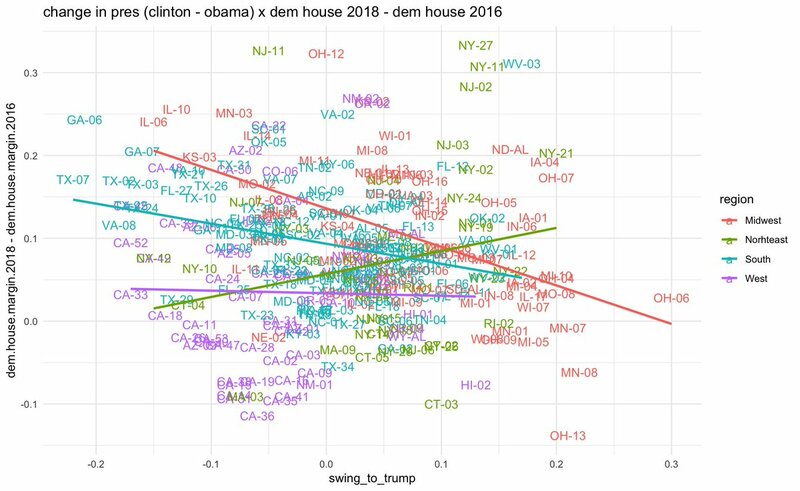 Lots to disentangle here, but I’m now leaning toward a narrative emphasizing both mean reversion and Dem appeal to WWCs (obv correlated). 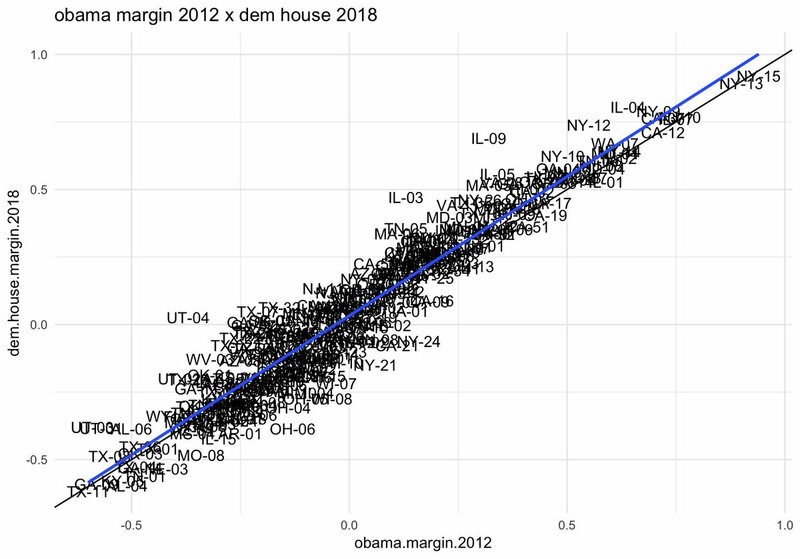 It looks like Democrats could very well approach the 53% of the vote that House Democrats won in 2008 on Obama’s coattails. All depends on how much is left in CA and WA. That being said... you kind of have to squint to get there. It sure looks like more of a 52, 52.5% race. 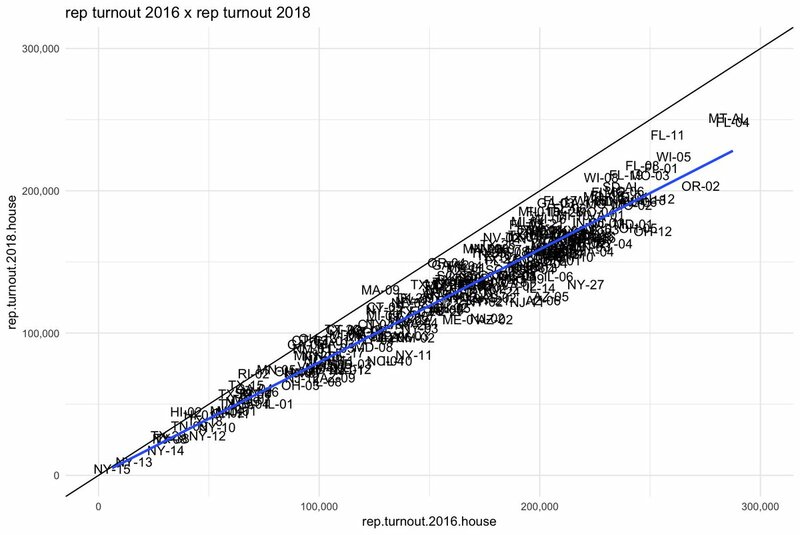 Results in the 2018 House midterms were better predicted by 2016 House and presidential results than 2012 House and pres results. 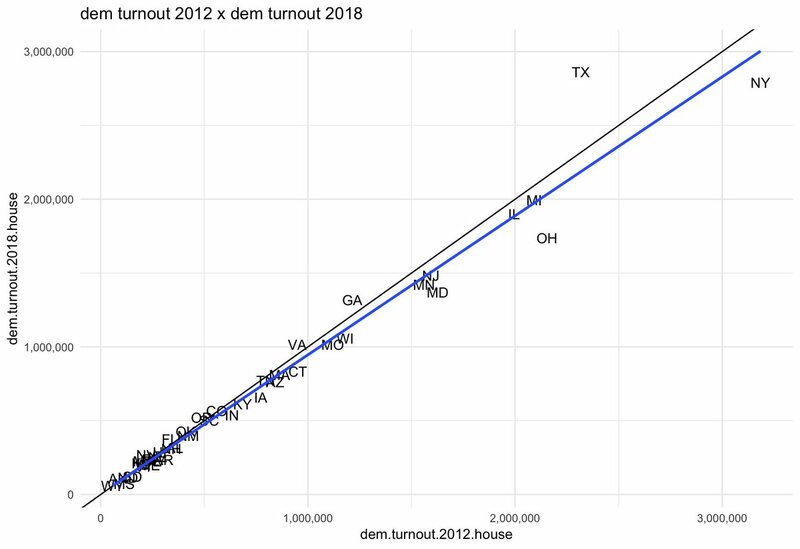 There's one large state where Dems gained voters vs 2012. 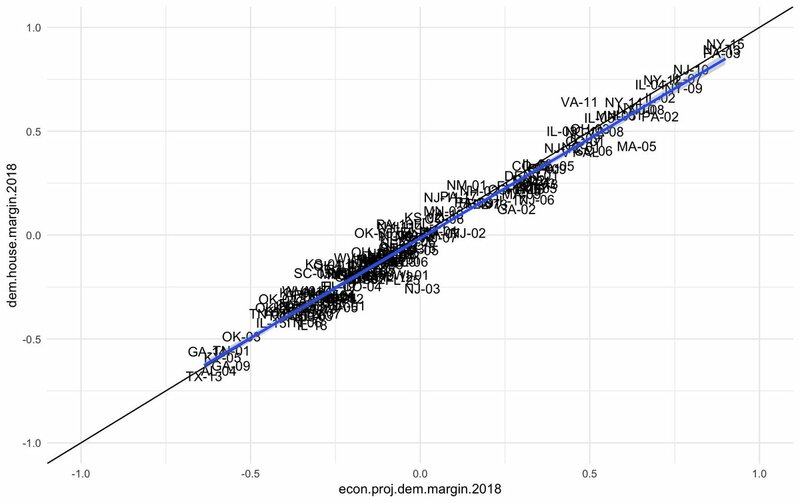 In races that were uncontested in both years, Democrats gained ~550,000 voters — The biggest increase nationwide. 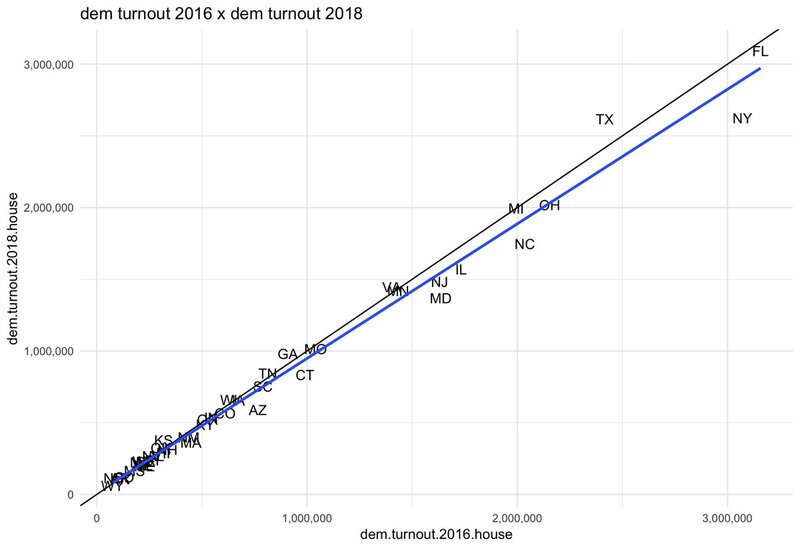 Versus 2016, 200k more voters. 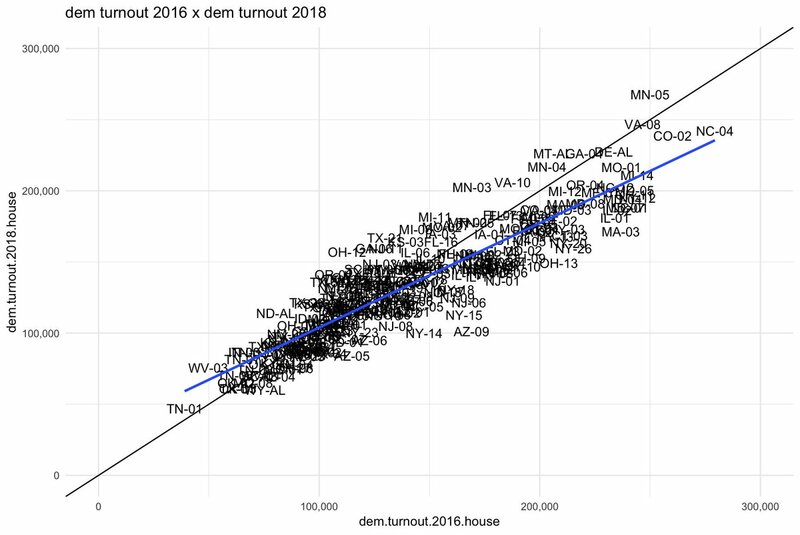 Rep turnout in twice-contested House races down 430k vs 2016.
cc @MattGrossmann it's possible I was reading that plot I sent you earlier backwards. 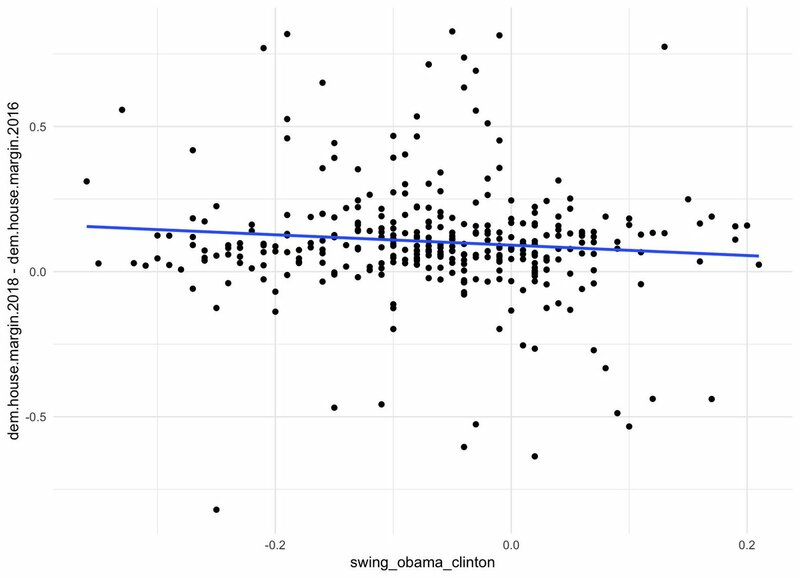 Midwestern seats that swung hard to Trump... kept swinging (relative to a 7-pt intercept). 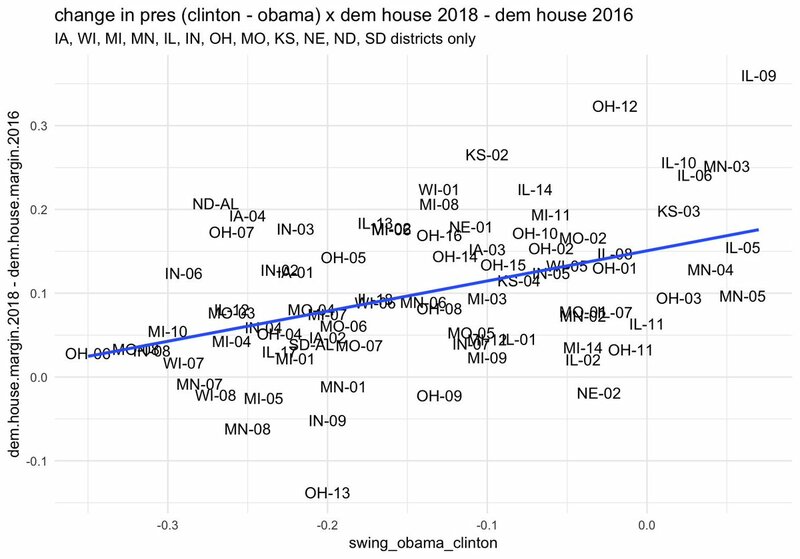 Look how different the elections looked in the Midwest vs everywhere else, though. ... is mostly an artifact of how wide you take your averages. 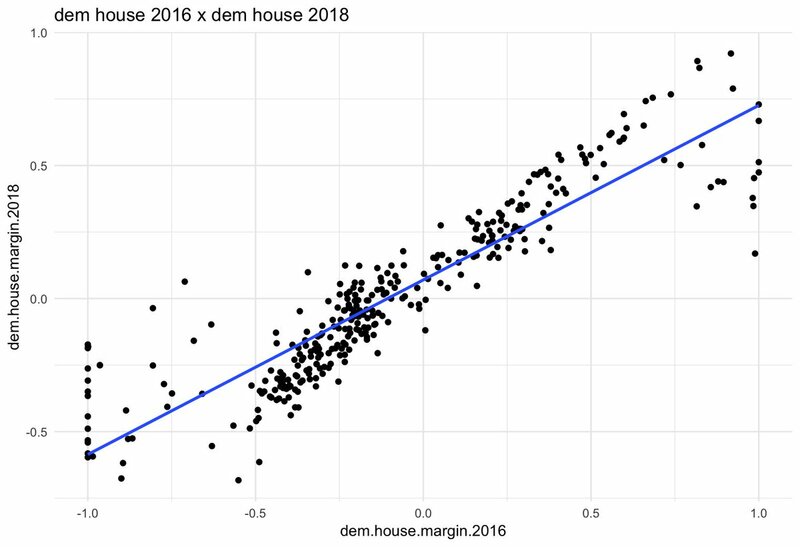 Monthly Democratic margin in generic ballot polling has been between 7 and 9 percentage points since October of 2017. 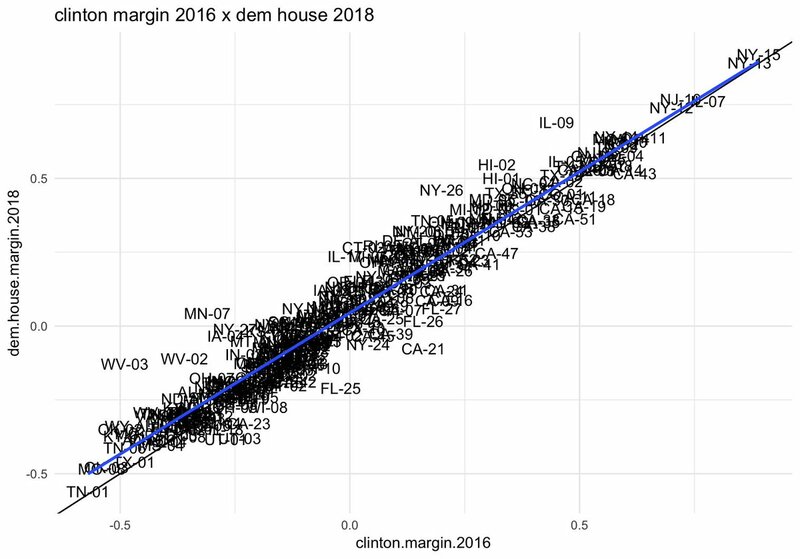 Combine with special elections, the wave looks nearly as tall as it did in March. 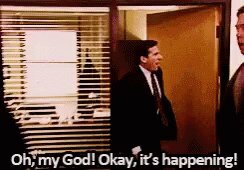 There are TWELVE special elections tonight! One high profile election in #AZ08, a Trump +21 congressional district, and eleven (11!) in New York, where two R seats are competitive possible flips. With results being dumped in for #NYSpecialElections, we have our first calls of the night… 3 holds for the Democrats. Democrats also hold NY #HD39 (uncontested) which Clinton won by 66 points in 2015. They are batting 4/11 tonight.